EC2Rescue for Windows is an easy-to-use tool that you run on an Amazon EC2 Windows Server instance to diagnose and troubleshoot possible problems. A common use of the tool is to reset the local administrator password. Password rotation is an important security task in any organization. In addition, setting strong passwords is necessary to ensure that the password doesn’t get hacked by brute force or dictionary attacks. However, these tasks become very challenging to perform manually, particularly when you are dealing with more than a few servers. AWS Systems Manager allows you to manage your fleet remotely, and to run commands at scale using Run Command. 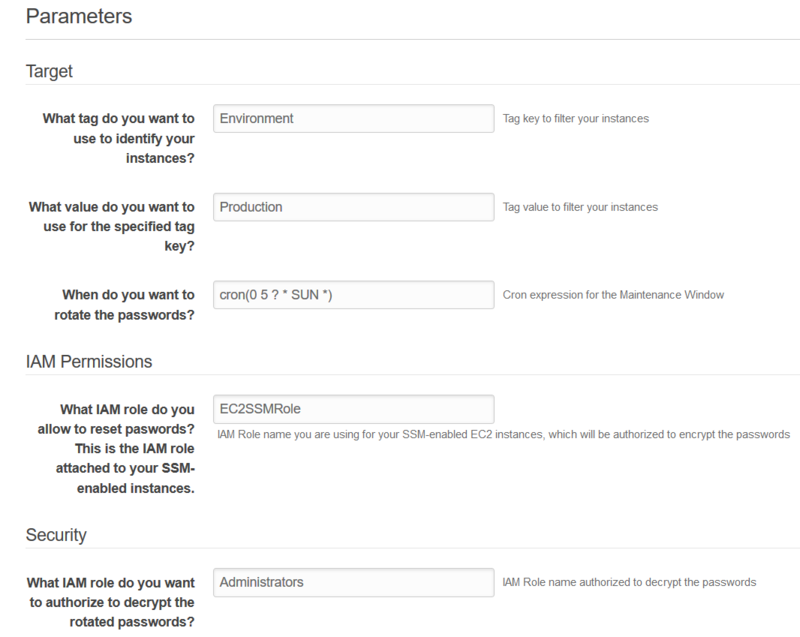 The Systems Manager Parameter Store feature is integrated with AWS Key Management Service (AWS KMS). Parameter Store allows for string values to be stored encrypted, with granular access controlled by AWS Identity and Access Management (IAM) policies. In this post, I show you how to rotate the local administrator password for your Windows instances using EC2Rescue, and store the rotated password in Parameter Store. By using Systems Manager Maintenance Window, you can then schedule this activity to occur automatically at a frequency of your choosing. EC2Rescue is available as a Run Command document called AWSSupport-RunEC2RescueForWindowsTool. The option to reset the local administrator password allows you to specify which KMS key to use to encrypt the randomly generated password. If your EC2 Windows instances are already enabled with Systems Manager, then the password reset via EC2Rescue Run Command happens online, with no downtime. You can then configure a Systems Manager maintenance window to run AWSSupport-RunEC2RescueForWindowsTool on a schedule (make sure your EC2 instances are running during the maintenance window!). In this post, I provide step-by-step instructions to configure this solution manually. For those of you who want to see the solution in action with minimal effort, I have created a CloudFormation template that configures everything for you, in the us-west-2 (Oregon) region. Keep reading to learn what is being configured, or jump to the Deploy the solution section for a description of the template parameters. First, you create a KMS key specifically to encrypt Windows passwords. This gives you control over which users and roles can encrypt these passwords, and who can then decrypt them. I recommend that you create a new KMS key dedicated to this task to better manage access. In a text editor of your choosing, copy and paste the following policy. Replace ACCOUNTID with your AWS Account ID. Administrators is the IAM role name that you want to allow to decrypt the rotated passwords, and EC2SSMRole is the IAM role name attached to your EC2 instances. Save the file as RegionalPasswordEncryptionKey-Policy.json. --description "Key used to encrypt local Administrator passwords stored in SSM Parameter Store." Use tags to identify which instances to reset the password. For example, you can reset all instances tagged with tag key Environment with value Production. These steps are only necessary if you haven’t configured a maintenance window before. Skip this section if you already have your IAM role with the AmazonSSMMaintenanceWindowRole AWS Managed Policy attached. In a text editor of your choosing, copy and paste the following trust policy. Save the file as AutomationMWRole-Trust-Policy.json. Use the following CLI two commands to create the IAM role AutomationMWRole and associate the AmazonSSMMaintenanceWindowRole AWS Managed Policy. Save the policy as EC2Rescue-ResetAccess-Policy.json. Here are the CLI commands to create a new IAM customer managed policy and attach it to an existing Systems Manager IAM role for EC2 (in this example, EC2SSMRole). To simplify the deployment of this solution, I have created an AWS CloudFormation template that configures all the parts described earlier in this post, and deploys this solution in us-west-2 (Oregon). Existing IAM role name you are using for your Systems Manager-enabled EC2 instances, which will be authorized to encrypt the passwords. Current IAM role name that you are using to deploy this CloudFormation template. The role is authorized to decrypt the passwords and manage the KMS key. The following figure shows the CloudFormation console, with the default template parameters and the existing EC2 IAM role named EC2SSMRole, as well as the administrative IAM role Administrators, which you use to create the CloudFormation stack. The deployment takes few minutes. Here is a sample maintenance window, which was last executed on October 29th 2017. Parameter Store has an encrypted parameter for each production Windows instance. You can decrypt each value from the console if you have kms:decrypt permissions on the key used to encrypt the password. In this post, I showed you how to enhance the security of an EC2 environment by automating secure password rotation. Passwords are rotated on a schedule, and these actions are logged in AWS CloudTrail. Passwords are stored in Parameter Store with a KMS key, so that you have granular control over who has access to the encrypted passwords with IAM policies. As long as your EC2 Windows instances are running during the maintenance window and are configured to work with Systems Manager, the local administrator password is rotated automatically. Additional maintenance windows can be created for other environments, or new targets added to the existing maintenance window (such as development, staging, or QA environments). Alessandro Martini is a Senior Cloud Support Engineer in the AWS Support organization. He likes working with customers, understanding and solving problems, and writing blog posts that outline solutions on multiple AWS products. He also loves pizza, especially when there is no pineapple on it.